The crafting system allows combining different ingredients to create new things. Crafting takes a list of defined ingredients and creates an outcome. Ingredients and outcome can be items, weapons, armors and currency. Creating items, equipment and currency can also be done using the research system. Crafting Types are used to separate the crafting process into different types – like forging or alchemy. They are created in the ORK Framework editor in Inventory > Crafting Types. The crafting types are used in menus to optionally separate the crafting recipes known by the player. To create a new item, the player needs to have the Crafting Recipe for it. They are created in the ORK Framework editor in Inventory > Crafting Recipes. Recipes can be added through the event system or by using items. A crafting recipe can optionally be consumed when using it (which also allows collecting multiple recipes of the same kind). A crafting recipe defines a list of ingredients needed to create a list of outcomes. 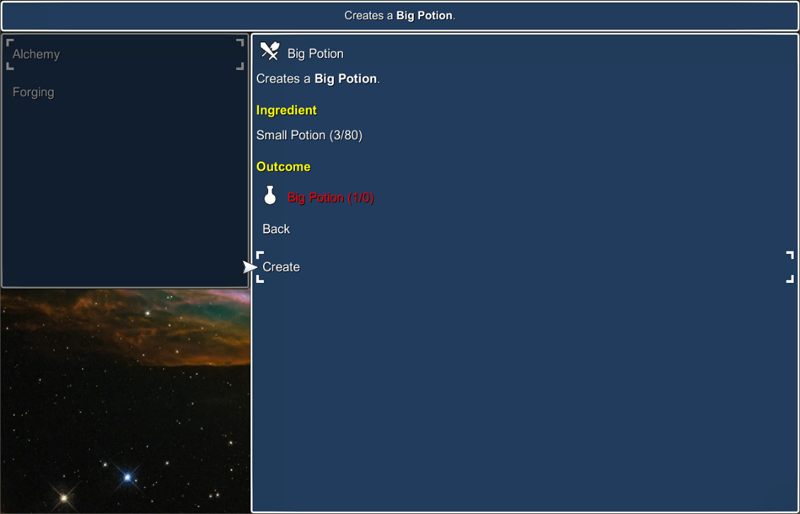 Ingredients and outcomes can be items, weapons, armors and currency. If ingredients are consumed in the crafting process is defined by their Chance setting – e.g. if creating a new sword requires an anvil, but it shouldn’t be consumed, set it’s chance to 0. Creating the outcome of a recipe can depend on a crafting chance. Beside using a simple value (like 80 %), you can also use formulas to calculate the success chance – i.e. you can use the player’s status values. This enables you to set up crafting status values to influence the player’s skill to craft certain items. Crafting recipes can be used through Menu Screens and the event system. There are different nodes available in the Game > Crafting nodes. Beside using a recipe, you can also add and remove recipes, as well as add the needed ingredients of a recipe and do various checks. The Crafting menu part allows you to display crafting recipes, optionally separated by crafting type. You can limit which crafting types will be displayed in each menu – this allows creating menus for each crafting type individually. With the possibility to open menu screens through the event system, you can use this to bind crafting certain items to locations in the game, like allowing forging new weapons and armors only when the player is in a smithy. How the crafting recipes and their ingredients and outcomes are displayed in the menu screen is defined by Recipe Layouts. The Default Recipe Layout is set up in Inventory > Inventory Settings – each crafting recipe and menu screen can override the default layout with an individual layout. The Crafting List menu part allows you to add different ingredients to a list and try to create something out of it. The outcome is based on crafting recipes, i.e. the first recipe matching the items will be used. Ingredients can be added to the list by using sub-menus (e.g. 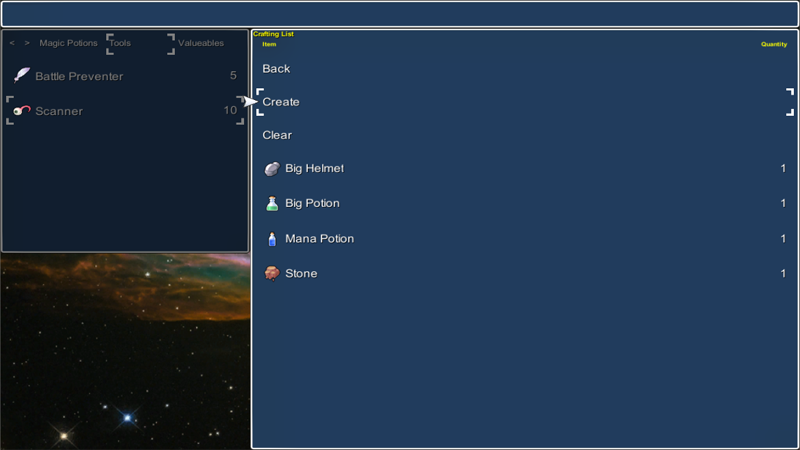 in an Inventory menu part) and through drag and drop (e.g. dragging an item into the crafting list box). < Scripting – where is what?